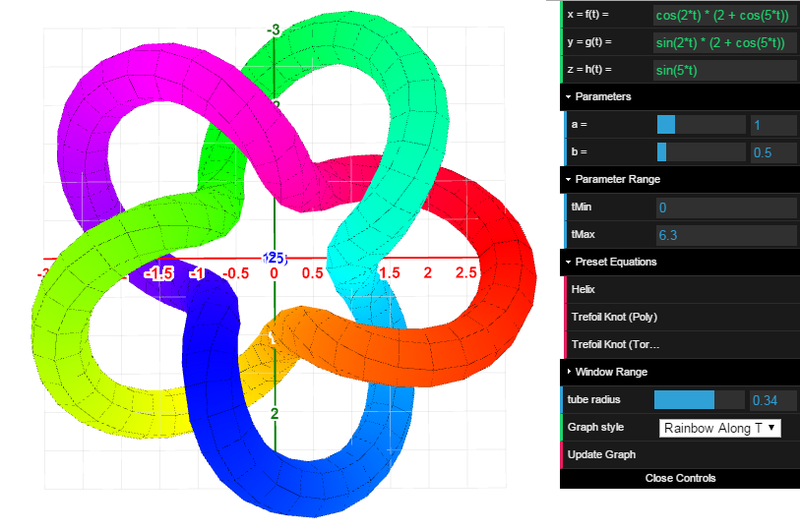 This webpage contains a collection of interactive mathematical visualizations built using MathBox: a library for rendering presentation-quality math diagrams in a browser using WebGL, built on top of Three.js and ShaderGraph. 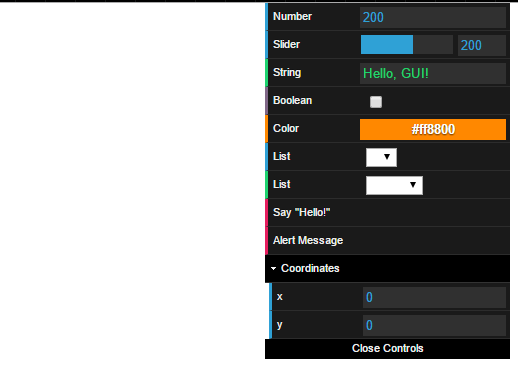 Most examples also utilize dat.gui for the user interface. This collection is hosted at GitHub. Last updated: 18 June 2016. 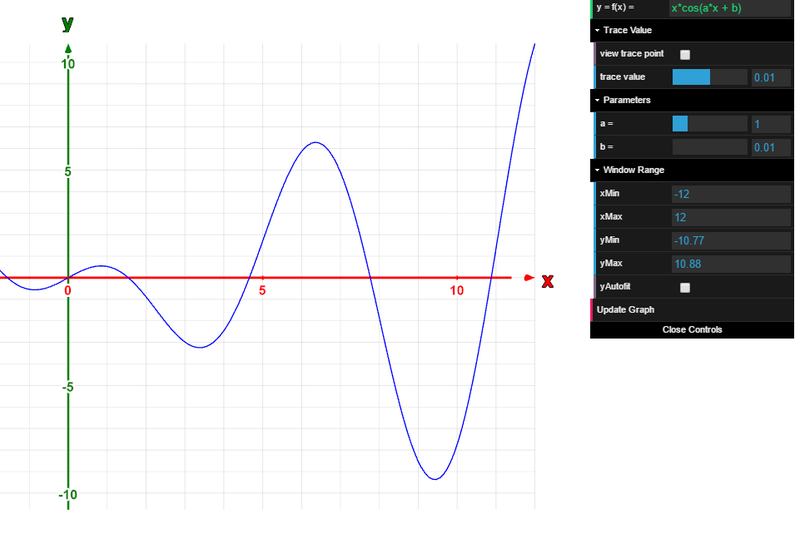 Illustrates how to create a graph of a 2D function y = f(x) in MathBox. Illustrates how to set up the different data types using dat.gui: numbers, number sliders, text, booleans, colors, lists, functions, and folders. axes are labelled, and y-bounds can be set to automatically fit themselves according to the minimum and maximum values of the function with the x-bounds. 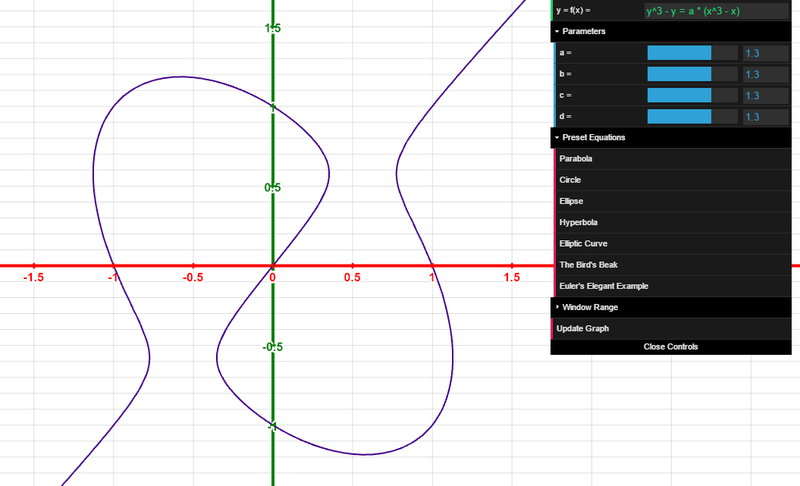 Graph of a 2D curve defined implicitly by f(x,y) = g(x,y). 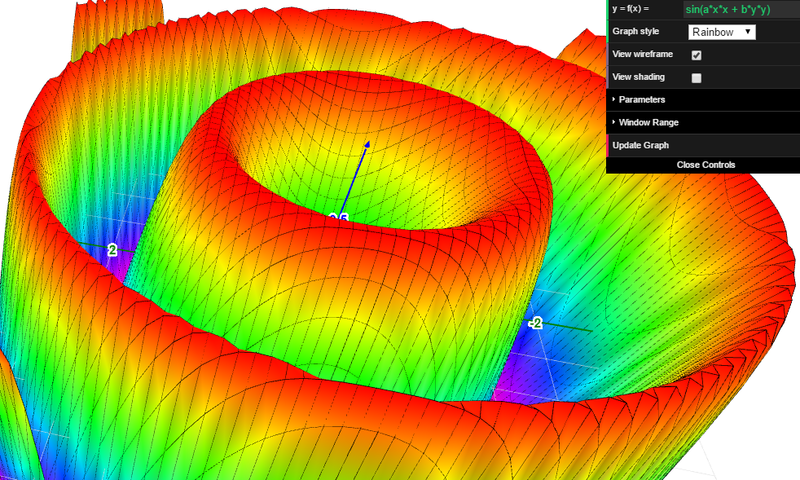 Uses the marching squares algorithm to approximate the curve. Includes a variety of preset equations. Graph of a 3D function z = f(x, y). Includes adjustable parameters, various color schemes, and optional wireframe and shading. 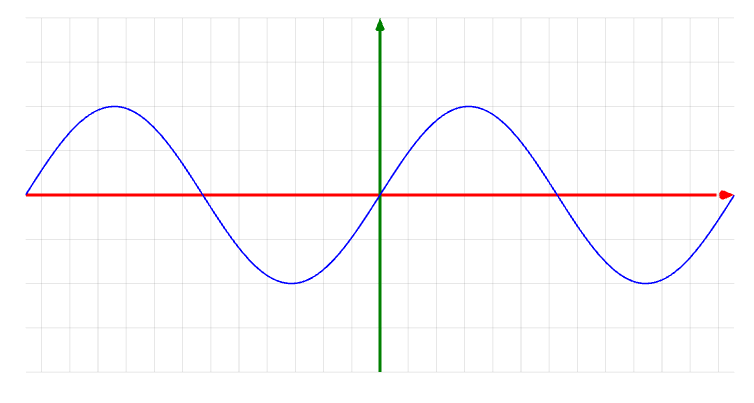 Graph of a 3D function z = f(x,y). Coordinates of a point entered as text. 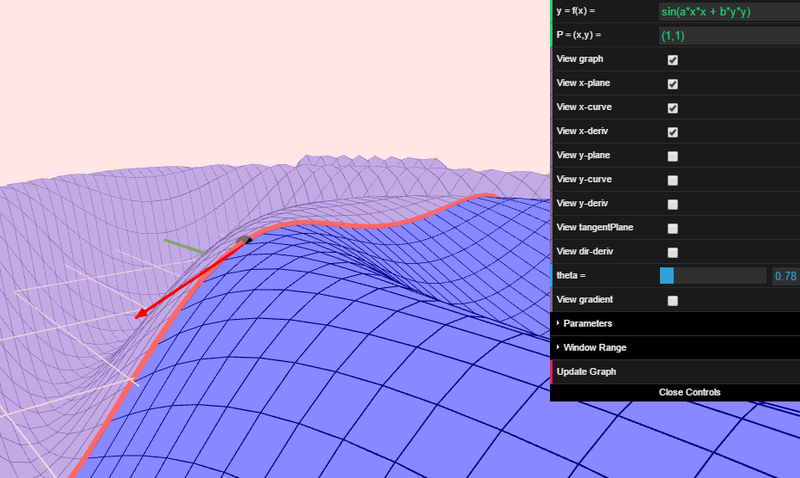 Includes optional graphs of x- and y- partial derivatives, tangent plane, directional derivatives, and the gradient at the given point. Graph of a 2D surface (x,y,z) = (f(u,v), g(u,v), h(u,v)) in 3D. 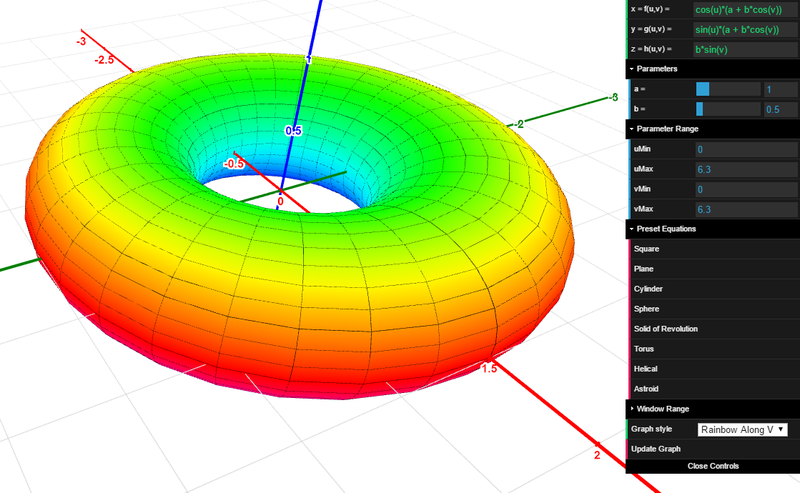 Graph of a curve (x,y,z) = (f(t), g(t), h(t)) in 3D. 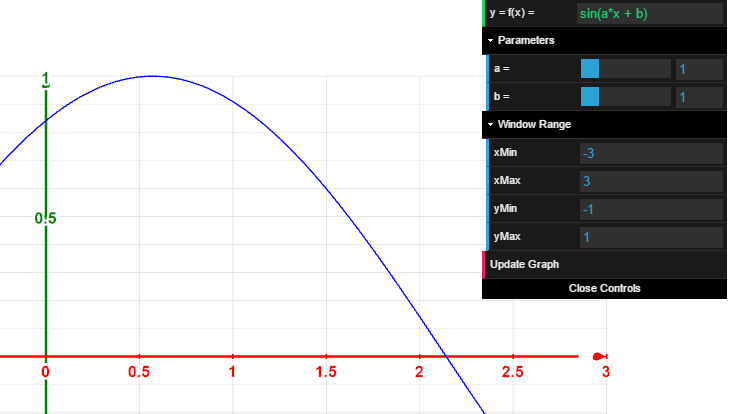 Plots a variable size/color tube around the curve for easier visibility.